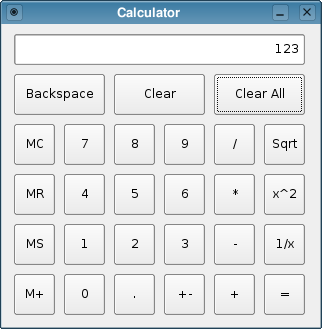 In this simple QtScript example, we show how to implement the functionality of a calculator widget. The program logic in this example is a fairly straight port of the logic in the C++ Calculator Example. The graphical user interface is defined in a UI file. Show the widget and start the application event loop. On the script side, the Calculator constructor function initializes the instance variables of the new Calculator object, and connects the clicked() signal of the widget's buttons to corresponding functions defined in the Calculator prototype object, so that when a button is clicked, the proper script function will be invoked to carry out the operation.